How many players can play Plants vs Zombies: Garden Warfare 2 locally (couch co-op)? When playing locally, does the game keep track of the second player's character progression, unlocks, and coins? How many players can play Plants vs Zombies: Garden Warfare 2 online? Is a Gold Membership or PlayStation Plus account required for the second player in combo co-op on the consoles? What direction is the screen split in couch co-op for Plants vs Zombies: Garden Warfare 2? 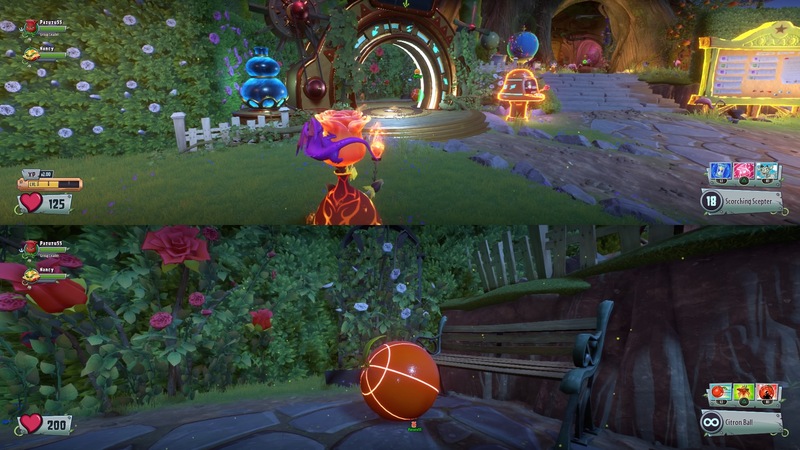 Does the PC version of Plants vs Zombies: Garden Warfare 2 support split screen play? 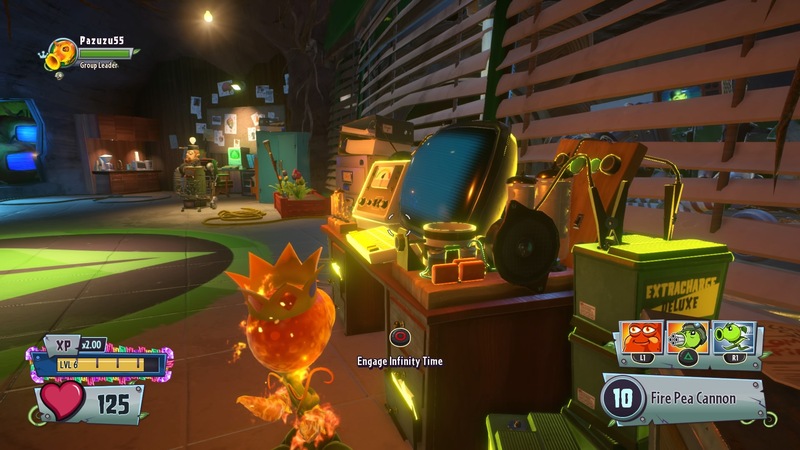 How do you begin a co-op session in Plants vs Zombies: Garden Warfare 2? When I join my friends online, or they join me, do we get to keep any experience and coins we earn? 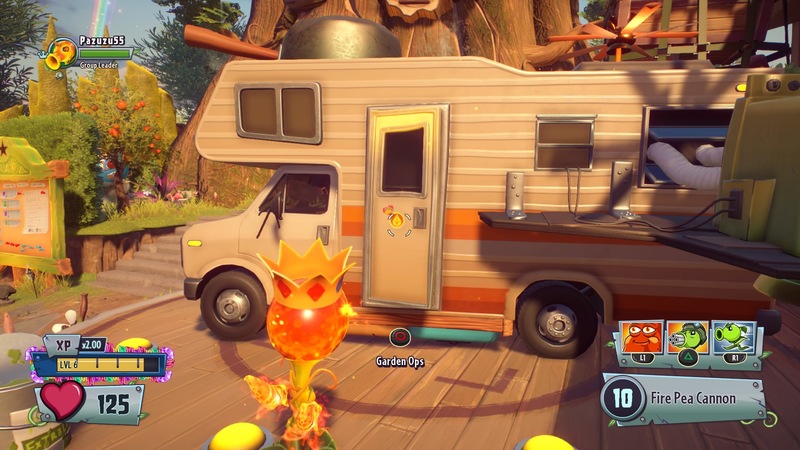 Can I join a game if the host is further along than me in Plants vs Zombies: Garden Warfare 2's single-player quests? Outside of Garden Ops and Graveyard Ops, what else can I do with friends? What is Infinity Time and how do I start playing it? How many players can play Infinity Time and do they have to unlock it for themselves? Other than being in a giant mech and shooting garden gnomes, is anything else different about Infinity Time? Two players are supported for the Xbox One and PlayStation 4 versions of the game. 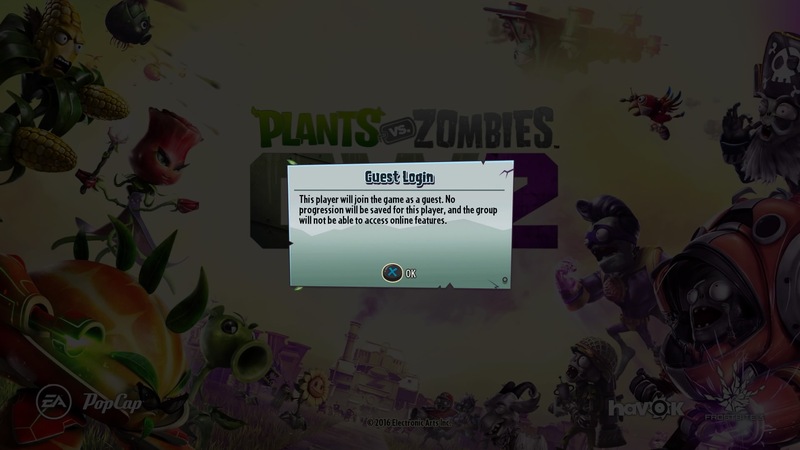 To enable splitscreen, the first play must find the splitscreen console located within the Plants or Zombies home base in the Backyard Battleground. Once the player interacts with the console, there will be an onscreen prompt asking the other player to press a button on his/her controller to join. Only if the second player has an Xbox Live Gold or PlayStation Plus account so that his/her account can connect to the EA servers. If the second player does not have an account with these services, then they cannot earn experience or coins, they cannot unlock new characters, and you cannot engage in any online activities. You can still setup local Garden Ops and Graveyard Ops matches, as well as local matches for any of the multiplayer modes. Up to four for the Backyard Battleground, Garden Ops, and Graveyard Ops. All multiplayer modes support 2 teams of 12 players each. Friends can be invited into your Backyard Battleground and you can then start a Graveyard/Garden Ops game from the appropriate console. You can also setup a private session from within the Graveyard/Garden Ops menus and invite friends from there. Yes. All experience and coins earned by players while playing online with their friends will be saved. Additionally, any characters, abilities, consumable items, or customization items you unlock by opening sticker packs are also saved. Yes. The single-player quests are optional and not required in order to play the co-op or multiplayer modes. All multiplayer modes - Team Vanquish, Vanquish Confirmed, Herbal Assault, Gnome Bomb, Suburbination, and Gardens & Graveyards - can be played with a group of friends against A.I. bots. You do not have to play against other players. Each of these modes support up to 12 players on one team, so you could setup a team of 12 humans against 12 bots. Any open spots on a team are automatically filled with an A.I. bot. There is also Infinity Time. 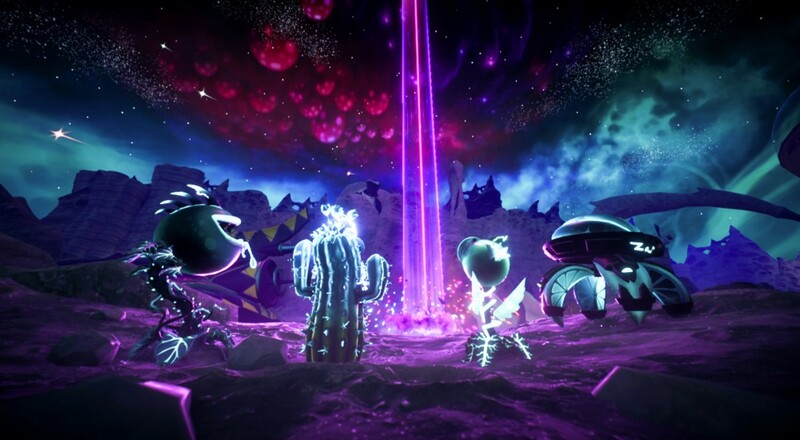 Infinity Time is a new co-op mode for Garden Warfare 2 that becomes available after you have completed all quests for either the Plants or the Zombies. This is a wave-based horde mode where you have to fight off as many garden gnomes as possible. Every 5th wave will pit you against a gnome boss. To start an Infinity Time session (after you've unlocked it), you will need to use the appropriate terminal in Crazy Dave-bot 3000.1's base or in Zomboss' secret underground facility. Both of these are located within their respective side's home base in the Backyard Battleground. Once you activate the terminal, you can start a session if you have at least 5 stars, which are earned by completing quests from the Quest Board. Up to four players, and no. Only the host has to have Infinity Time unlocked. The host invites the other players to his/her Backyard Battleground, and then starts the mode from the appropriate console. Unlike in any of the other game modes, your character's health does not regenerate. Picking up the time shards dropped by defeated gnomes will heal 50 health. You also cannot revive a downed player. Players will automatically revive at the start of each wave at 500 health.